This past weekend Big E and I flew up to NYC to visit my brother and sister-in-law. I'm happy to report that nothing traumatic happened on either leg of the trip. In fact, Big E passed out about two minutes into the flight home and remained in a coma until the wheels touched down in ATL. 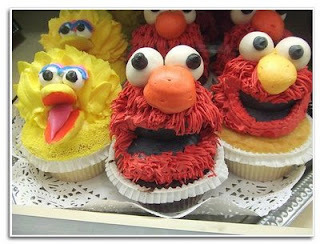 Saturday afternoon we took Big E down to the Chelsea Market to get his Elmo cupcake that he's been clamoring for ever since my brother texted me a picture of it a few months back. I showed it to Big E and he lost his mind. That is all he has been talking about. If I needed him to behave, this was my golden ticket. I just had to mention "The Elmo Cupcake" and Big E became a perfect angel. As we walked into Ruthy's, Big E's eyes grew as wide as saucers. His mouth gaped open. This was it. And he knew it. We settled into a small table and watched Big E murder his cupcake. Murder is really the only way to describe it. This cupcake was huge and easily 500 calories. Big E had inhaled Elmo in his entirety in about seven minutes. We left the scene of the crime and made our way to my sister in law's favorite NYC gelato place. Of course we were going to have some. We were on vacation, so I even asked Big E if he wanted a scoop, even thought he had just eaten enough sugar to fuel himself for the next five years. We waited in line and each ordered a scoop, with the exception of Big E.
As soon as he saw us all eating the gelato he wanted in on that game. It was too late. We weren't getting back into that painfully slow line. Big E started crying. Whining. Hyperventilating. We quickly left Chelsea Market and made our way to the street. The plan was to get dinner as we were doing things in reverse. Cupcakes. Ice cream. And finally, pizza. Big E had other plans. He threw a major tantrum. It was epic. I WANT ICE CREAM! I WANT ICE CREAM! I WANT ICE CREAM! As we walked along the sidewalk, even the aloof New Yorkers couldn't help but notice Big E.
My three year old was pining for ice cream while the three of us noisily enjoyed our gelato. MMMM. THIS IS SO GOOD. DELICIOUS! The New Yorkers didn't say anything to us, but their eyes said it all. WHAT A BUNCH OF SELFISH A**HOLES! I didn't feel like explaining to everyone that walked by that my crying child just ingested the biggest cupcake of all time. And that I actually offered him the gelato and he declined. Instead, I let them judge me. YEAH, YEAH, I'M THE MEANEST MOM EVER. Now excuse me while I get back to my biscotti gelato. It really was that delicious. As Aunt Yoy would say, the icing to cupcake ratio was excellent!